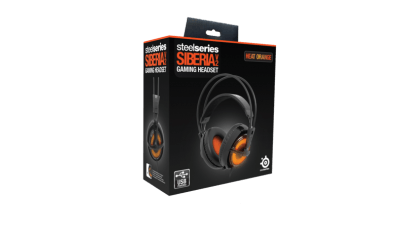 The SteelSeries Siberia v2 Heat Orange Edition is the latest addition to the Siberia line of headphones that started back in the mid-2000s with the well regarded Icemat Siberia. Since then, some small design and hardware improvements have been added. In the v2 Heat Orange Edition, the Siberia now sports an integrated USB sound card, 50mm drivers, a retractable microphone, and a bright orange and black colour scheme. Inside the SteelSeries Siberia v2 box, we find the headset, a USB extension cable, and some paperwork. 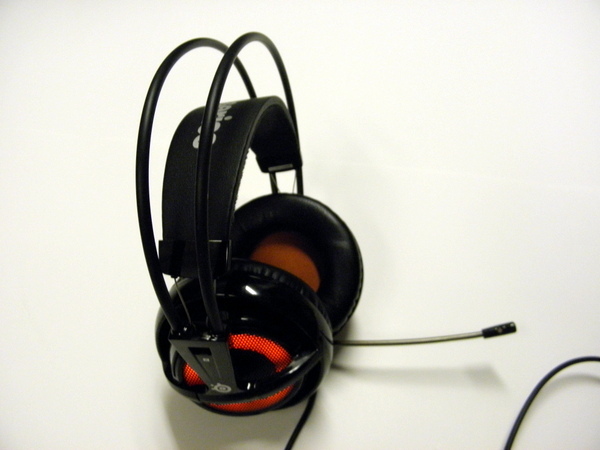 The headset’s cable is kept short for ease of use for laptop gamers. Approximately two feet down the headset is the mute switch and volume control. Another foot and a half down is the cable is the USB sound card. The USB plug is built into the end of the sound card. Those needing extra length will find a generous USB extension cable roughly six feet in length. Both cables are slightly thicker than the average USB cable but extremely light. The strain reliefs on the ends of the cables are slightly pliable which bodes well for the headset’s long term survival. The cable length is perfect for laptop users, however, I found the volume and mute switch to hang a little low for my liking. Those on the shorter end of the spectrum may find themselves sitting on the remote. The volume wheel is tightened perfectly so there will be no accidental change of volumes. I liked the fact the wheel is coated with a rubbery material to ensure good grip. The remote has a glossy finish. This can make the mute button a little difficult to manipulate with dry fingers. I found the best way to do it was to lay my thumb flat against the switch and slide the switch. There is a dark brown line to signify the microphone muted that can be difficult to see in low light conditions. I believe a bright orange that matched the headphones would have been a better colour choice. The SteelSeries Siberia v2 headset is extremely light. They are full sized over the ear headphones. The ear cups are generously sized, so most ears will fit inside. The cups are a little shallow, so ears that end to protrude away from the head may bump up against the inside. The material that pads the insides of the ear cup is a dark pumpkin orange. The ear cup padding is made from a very soft foam that is extremely comfortable to wear for long periods of time. The padding is covered in a leather material that can get a little damp during an extremely hot gaming session, but the padding does allow enough airflow within the ear cups to prevent sauna like conditions. 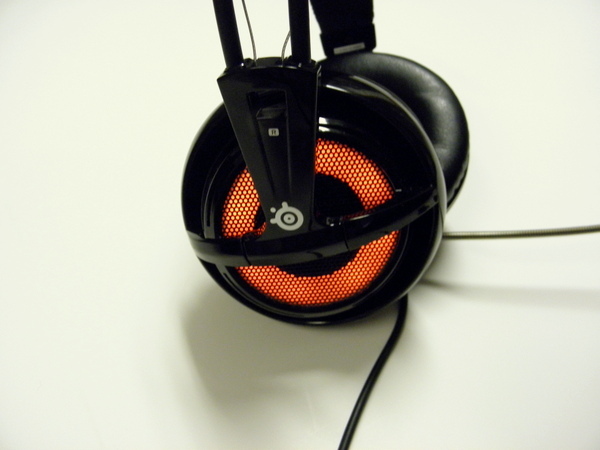 On the outside of the ear cups are a mesh grille that hides the 16 orange LEDs. They are a very intense shade of orange that contrasts nicely against the gloss black plastic. The light distribution is very even which produces a nice orange band in the ear cups. The Siberia’s suspension system means no fiddling around to size the headphones. They are slid on and immediately adjust themselves to the users size. It is an extremely comfortable system that is often found in higher end headphones from brands like AKG. The self-adjusting headband is attached with four thin metal cables that runs into the ear cups. 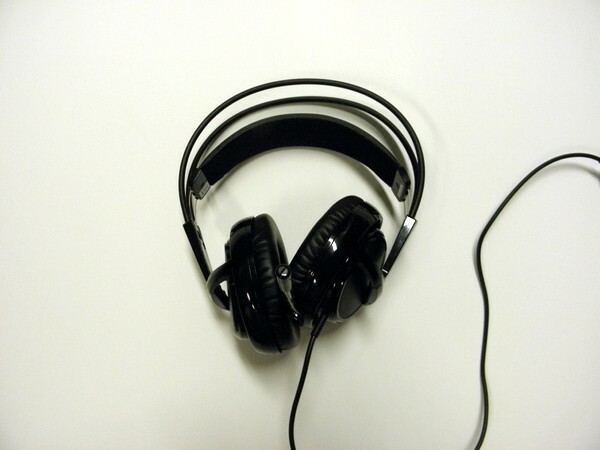 The headband is able to move back and forth which may be a problem for those who prefer to slide their headphones on horizontally versus putting them on vertically. The horizontal slide is used especially by those with long hair who need to brush back their hair away from their ears before putting on the headphones. Unfortunately, the design means the suspended headband can catch on the forehead. Some adjustment will need to be made to accommodate those with long hair, whether the hair is pulled back in a ponytail or some change in how the headphone is donned. The sound quality in the Siberia v2 is very good. It is a closed headset which means the ear cups are closed to outside sound. This is excellent for those who play in noisy areas or share their space with others as the sound that leaks out is minimal. The bass is strong without overpowering the headset’s highs and mids. Upon listening to music, I noticed that the extreme highs does suffer from a slight distortion. Most musical genres, games, and movies will not hit those levels, but those who enjoy certain genres of music like classical may find the distortion distracting. The soundstage is pretty large for a closed headset, a type that tends to struggle with extremely small soundstage. With the large soundstage, I could easily pick out distant sounds in Battlefield 3, a boon for competitive FPS gamers. 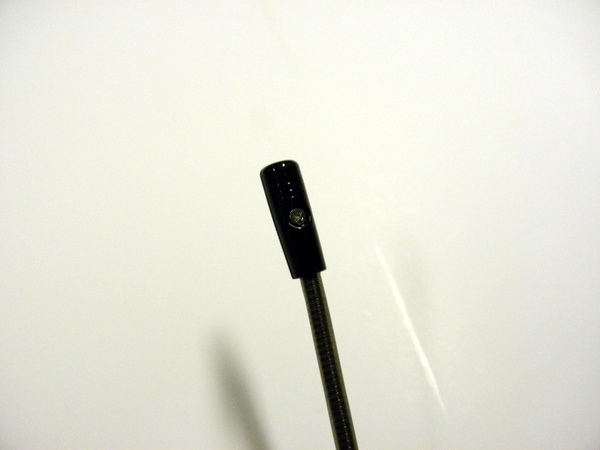 The microphone is a retractable microphone that stows away inside the left ear cup. When stowed, the Siberia v2 could easily be mistaken for a regular pair of headphones. The microphone is attached to a bendable plastic that can be easily shaped for any size and build. There is no foam padding to act as a pop filter, so one should be very careful with the positioning of the microphone to ensure it is away from the nose and mouth. A Darth Vader breath effect is no fun to listen to. The microphone’s audio quality is very good. It picks up voices clearly and sports an active noise cancelling microphone to help deal with noisy environments. My noisy computer fan is often picked up by microphones. The Siberia’s active noise cancellation did an excellent job on recording my voice, not the fan. 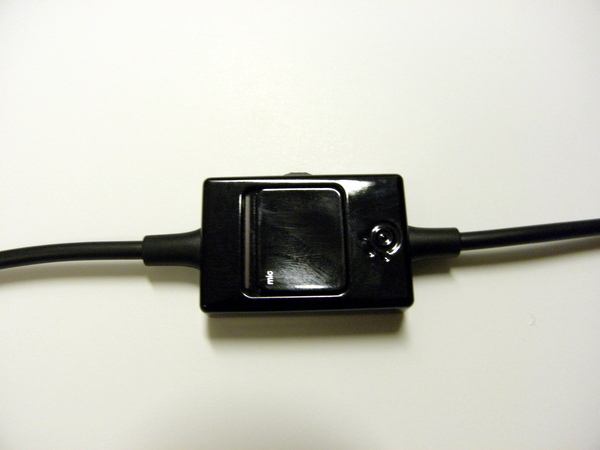 The headset works as a plug and play USB device for most Mac and Windows computers. 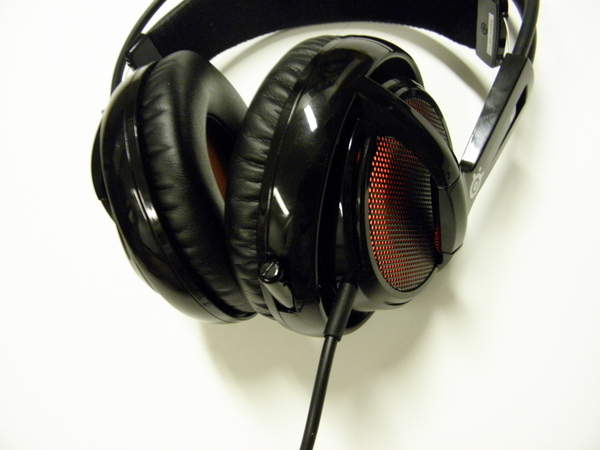 The SteelSeries Siberia v2 can be used without the SteelSeries Engine. However, the Engine allows users to control the LED brightness and the pulsation effects or turn off the LEDs completely. The Engine also allows users to tweak the equalizer settings. The headset defaults to the “Balanced” profile, but there are profiles optimized for precision FPS gaming, voice chat, etc. Priced at $119.99, the SteelSeries Siberia v2 Heat Orange Edition is priced at the high end for a stereo USB headset. However, it features an excellent design for extended wear and strong audio performance. The Siberia v2 is most definitely worth to extra money for anyone looking for an extremely comfortable set of headphones.